Guadalupe Ranger District – Soldier Prescribed Fire (Lat: 32.0817 x Long. -104.7731) 4,300 acres, broadcast burn. Located 40 miles southwest of Carlsbad and about 5 miles south of Queen, NM. Smoke during aerial ignitions on Thursday, May 5.
treated 4,300 acres with prescribed fire (this week) which was the target acreage for the Soldier Prescribed Fire project. All ignitions are completed and firefighters will continue with clean up of unburned islands of fuel within the fire perimeter. Firefighting resources, including equipment and personnel, will be released over the next few days, as the fire cools down. Some residual smoke may be visible tomorrow but is expected to diminish significantly over the next 2 to 3 days. THIS IS THE LAST UPDATE, UNLESS THERE IS A SIGNIFICANT CHANGE TO REPORT. Prescribed Fire Update – 5/6/17 – 12:30 pm: Today’s weather conditions are allowing for ignitions to continue. Ignition operations are underway on the Soldier Prescribed Fire project. Based on current weather forecasts, today may be the last day for ignitions. Prescribed Fire Update – 5/5/17 – 9:30 pm: An additional 800 acres were treated with prescribed fire today on the Soldier Prescribed Fire project. Ignition operations were conducted utilizing both hand and aerial ignitions. The plan for tomorrow is to continue with aerial ignitions IF weather conditions remain favorable. The project remains staffed with 55 personnel and equipment which includes the helicopter and 5 engines. Prescribed Fire Update – 5/5/17 – 3:15 pm: Aerial ignitions are underway. There may be an increase in smoke emissions this afternoon. Firefighters working the edge of the fire. fuel. IF conditions remain favorable through the morning, then aerial ignitions (with the helicopter) will begin around 1:00 pm. Prescribed Fire Update – 5/4/17 – 9:30 pm: Although ignition operations remained suspended through today, firefighters focused their efforts on securing the perimeter and monitoring interior smokes and pockets of fuel that were still actively burning. Weather forecasts for tomorrow are predicting conditions that will be favorable for resuming ignitions, however the determination will have to be made in the morning after receiving the spot weather forecast for the day followed by a test fire. Light smoke lingered over the area today, since winds were minimal at 3 – 5 mph. Prescribed Fire Update – 5/4/17 – 9:30 am: Local weather conditions on the project site are still not conducive for proceeding with ignition operations, however, firefighters are continuing to scout, patrol and monitor the 2000-acre area that was treated on Tuesday. Constant monitoring of weather conditions continues throughout the day, hoping for drier conditions to be present in order to resume ignition operations. previous day’s operations. Ground forces focused on reinforcing the control lines and scouting for areas that needed attention. Only light smoke was visible in the vicinity of the fire today. The project remains staffed with 55 personnel and equipment which includes the helicopter and 5 engines. Prescribed Fire Update – 5/3/17 – 1:00 pm: Due to current weather conditions, which affected both daytime temperatures and RH (relative humidity), aerial and hand-ignitions are temporarily postponed. Based on the today’s spot weather forecast for the project area, this may cause a one or two-day delay for ignitions. While ignitions are in a “holding pattern” firefighters will continue to work on the areas well within the perimeter that was established over the past two days. There is some active fire that is burning through tall, dry grass and shrubs at a low rate of spread, throughout the 2,200 acres that have been treated over the past few days. Where higher concentrations of fuels, exist, fire behavior intensifies, but firefighters are working to ensure that fire does not travel past the established control lines. Today’s activities will likely result in less smoke emissions (than yesterday’s). Prescribed Fire Update – 5/3/17 – 6:00 am: Yesterday, a combination of hand and aerial ignitions resulted in 2000 acres treated on the Soldier Prescribed Fire project. Favorable weather conditions, which included light winds contributed to the success of yesterday’s operations. Smoke was visible from Queen and surrounding areas, however the light winds did help with smoke dispersal. IF weather conditions are favorable today, firefighters will proceed with ignitions. Again, continuing operations WILL BE weather dependent. The determination to proceed–or not, will be made later this morning. This 3 minute YouTube video describes PSD Aerial Ignitions (Published on July 17, 2016 – Filmed at the Hayden Pass Fire Helibase: Garden Valley Helitack squad leader D.W. Cook and crew members demonstrate how PSD, also known as ping pong balls, really work). Prescribed Fire Update – 5/2/17 – 8:30 pm: Today’s mission, which included aerial ignitions on the Soldier Prescribed Fire project went well and according to plan. The helicopter flew most of the afternoon and ceased ignitions around 7:30 pm. Firefighters are still working the fire and continuing with hand ignitions. An update on acreage treated today will be provided sometime tomorrow. The plan is to continue with ignitions tomorrow, as long as weather conditions remain favorable. 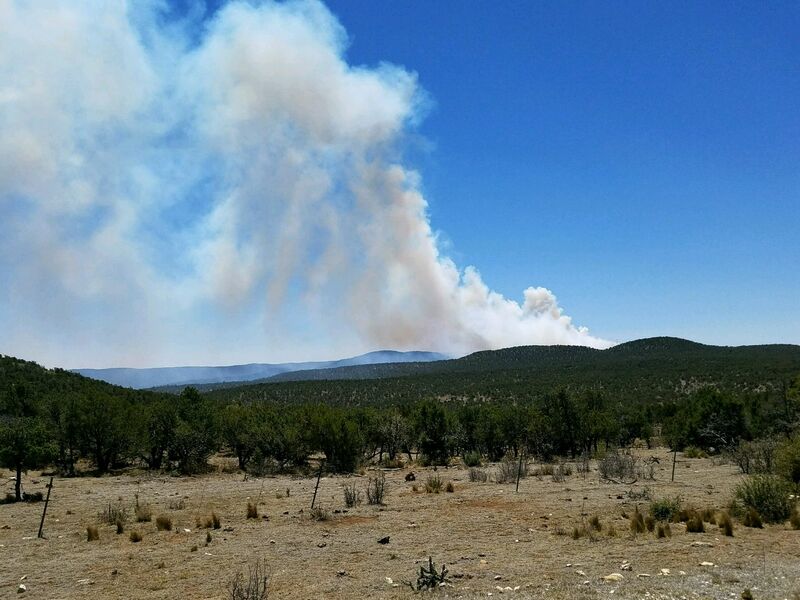 Although smoke emissions increased during the aerial ignitions, light winds out of the southwest contributed to excellent smoke dispersal. 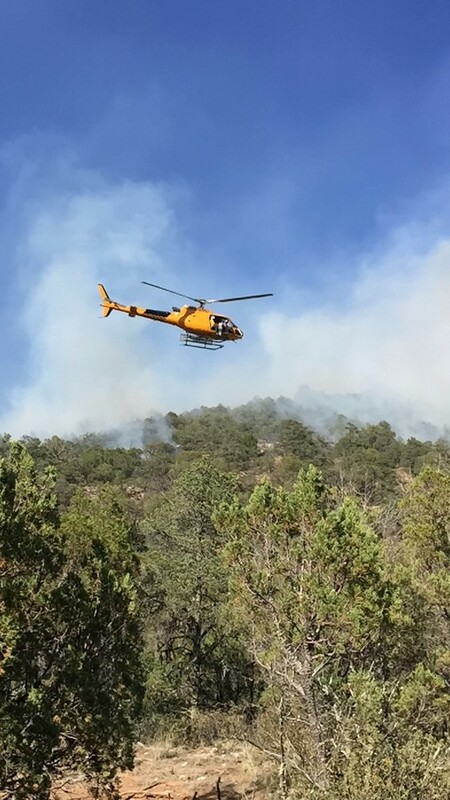 The project is appropriately staffed and, at this time, firefighting resources assigned to this project include: 2 Interagency Hotshot Crews, 5 Engines, Helicopter, and miscellaneous overhead–approximately 55 personnel. Prescribed Fire Update – 5/2/17 – 5:00 pm: Aerial ignitions are going well. All operations normal. Light winds out of the SW are helping with smoke dispersal. Next update will be posted around 8 pm. Slight increase in smoke emissions during aerial ignitions. and trained crew) is now being used to conduct aerial ignitions. Smoke emissions are expected to increase as the ignitions cover a broader area within the project unit. Prescribed Fire Update – 5/2/17 – 9:30 am: This morning’s TEST FIRE was successful and today’s weather conditions remain favorable! Firefighters are continuing with ignitions. Smoke will be visible during ignitions. Prescribed Fire Update – 5/1/17 – 1:30 pm: Today’s weather conditions are favorable! Ignitions are underway. Full complement of resources are on site: 2 Interagency Hotshot Crews, 5 Engines, Helicopter, and miscellaneous overhead. Approximately 55 personnel are currently assigned to the project. Firefighters will begin blacklining today and plan to follow up (probably tomorrow if conditions remain favorable) with aerial ignitions. Smoke will be visible during ignitions. Firefighters will likely work late into the night to ensure that all lines are holding and that the perimeter is secure prior to continuing with the aerial ignitions that will help facilitate movement of the fire to achieve the resource management objectives of this broadcast burn. Blackline: Preburning of fuels adjacent to a control line before igniting a prescribed burn. Blacklining is usually done in heavy fuels. The blackline helps lessen the chances for spotting across the control line, once the interior fuels are ignited. Broadcast Burn: The controlled application of fire to fuels, under specified environmental conditions that allow fire to be confined to a predetermined area. Fire behavior and intensity will result in meeting resource management objectives that include: reducing the threat of wildfire to communities, improved wildlife and range conditions and improved watershed conditions. Prescribed Fire Update – 4/27/17 – 9:30 am: Current weather conditions, including high winds, are causing another delay of ignition operations on the Soldier Prescribed Fire project south of Queen. There is currently some preparation work that is being done on the project that does not entail ignition operations. Support resources, such as the helicopter, will not mobilize to the site until all conditions are favorable – that mobilization of special resources and the full complement of personnel usually mobilize a day before or day of the planned ignitions. At this time, there are some (approximately 12) personnel working on the project. Prescribed Fire Update – 4/24/17 – 11:30 am: The NEW target date for ignitions has been changed to Thursday, April 27th, IF weather conditions are favorable. As soon as ignitions begin, this post will be updated to indicate that ignitions are underway and that smoke will be visible during ignitions. 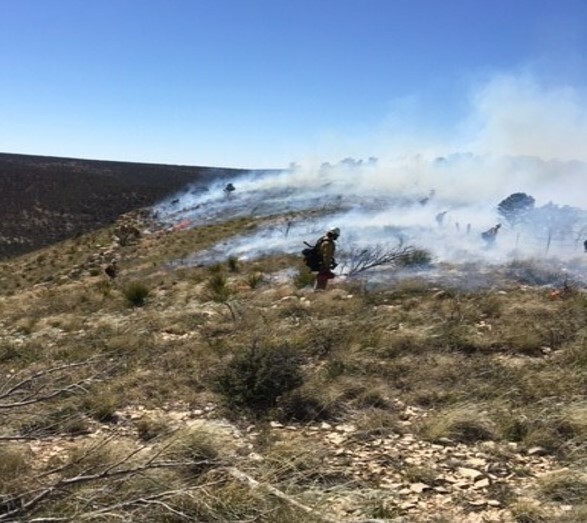 CARLSBAD and QUEEN, NM – The Soldier Prescribed Fire project is located 40 miles southwest of Carlsbad and approximately 5 miles south of the community of Queen, NM. Firefighters plan to treat up to 4,300 acres with prescribed fire through broadcast burning. A broadcast burn is the controlled application of fire to fuels, under specified environmental conditions that allow fire to be confined to a predetermined area. Fire behavior and intensity will result in meeting resource management objectives that include: reducing the threat of wildfire to communities, improved wildlife and range conditions and improved watershed conditions to the Dark Canyon area. Specific criteria must be met in order for a broadcast burn to take place, including smoke dispersal conditions, current weather and fuel conditions, and wind speeds and direction of winds. All conditions must fall within the specific ranges that have been identified in the approved burn plan before ignition operations can begin. Appropriate staffing, types of resources and contingency resources must be on-site or available in accordance with the project-specific burn plan, as well. Firefighters hope to implement ignitions between the dates of April 24th and May 5th. Ignitions can only begin if all conditions are met and in accordance with the prescription outlined in the approved burn plan on the day of the burn. Once ignitions have begun, they can continue with prescribed fire operations as long the conditions remain favorable. Public and firefighter safety is always our priority with both prescribed and wildland fire. 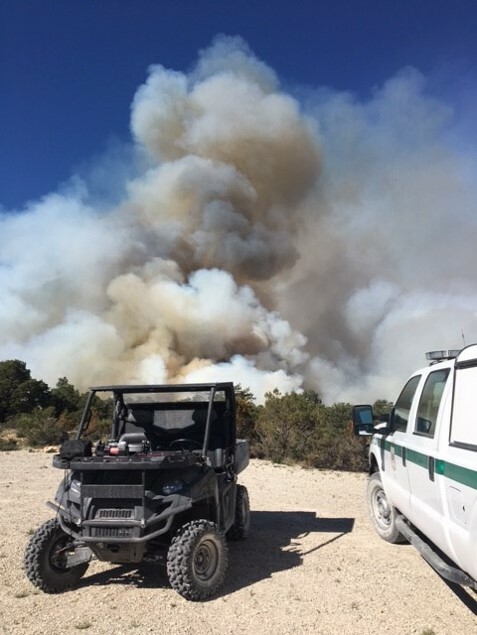 The organization that is assigned to the Soldier Prescribed Fire project includes more than 40 firefighters, four engines, three UTV’s equipped with pump packages (water storage and pumping capability), helicopter, and supervisory staff (8 – 10 overhead).